Hi folks, I am going to make the lovely Julia the WOYWW queen, a very happy lady today. 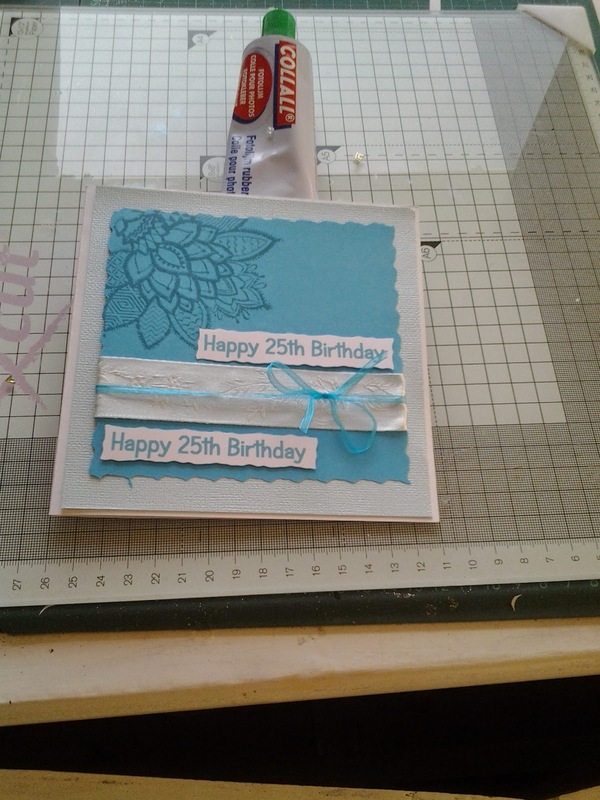 A very short post because I have just finished some cards and posted them to great niece and nephew, and all that is on my desk is 50th birthday card for a friend and some general clutter. 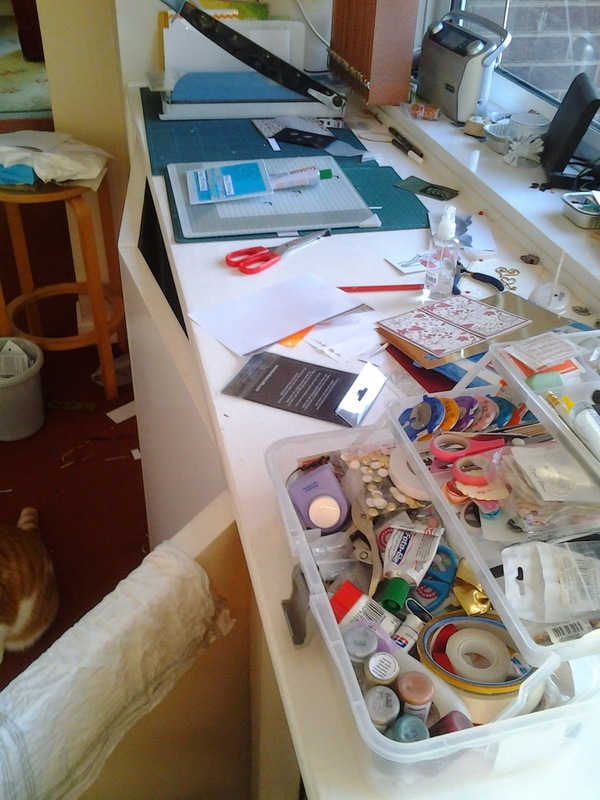 So there you have view of my tool box and bits beyond it, and the card on my glass cutting mat. The eagle eyed might also see Max sitting on the floor in front of the cupboard. Didn't realise he was there. And here you can see the card. She said she was 25 again so that's what the card says although there are very pale stamps of 50th on the paper. I'm out all day today, so probably will not be able to visit until Thursday, but will then I will have a whale of a time. Morning, Chris. I like the style!! Trust the recipient likes it too. I know someone who puppy walks up in the Wirral so it was a cause that I think is important. Nice card! I like the 25th birthday on there twice, very clever! Luckily the snow is all but gone, it was a minor blip and Spring will soon march on again. That was my first attempt with the punchinella, I did tape it down so it wouldn't shift, and I dabbed the inks on to scrap paper to decide the colours, but that's all. Have a go! enjoy your Easter. ... and yes spot Max cheeky fellow! Thanks for visiting and I hope you have had a wonderful Easter. Lovely 25th (again) birthday card. My favourite colours.